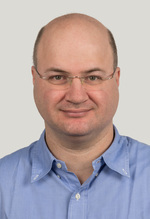 Gabor Kosa received his B.Sc., M.Sc and PhD degrees from the Technion in Haifa, Israel in mechanical engineering. From 1995 to 1998, he served in the Israel Defense Force (IDF) as a research engineer. He was post-doc in the Computer Vision Laboratory in ETH Zurich, Switzerland working on novel sensing for haptics, swimming micro robots, leading the biomedical micro systems group. He was senior lecturer at the School of Mechanical Engineering in Tel Aviv University and head of the laboratory of Robots and BioMedical Micro Systems (RBM2S) and the Education Robotics Laboratory (ERL). Currently he is with the BIROMED-Lab in the Department of Biomedical Engineering at the University of Basel. His research projects are in the field of Medical Robotics, Micro Systems and Micro Robots for biomedical applications and Bio Inspired Sensing Systems and Robots. His expertise is in the fields of robotics, micro systems, sensing and actuation, micro fluidics, piezoelectricity, dynamics and control.